The Tasting Room Welcomes Adinah Dutton! Adinah Dutton is a Finger Lakes native, raised in Cayuga NY. She holds a visual arts degree from Wells College 2012, where she received awards for her sculptures. Adinah has translated her artistic talent and education into the culinary arts, where her creative mind offers endless possibilities. She took the valuable opportunity to apprentice with Henry Paul Benveniste, a French born pastry chef known for pioneering the farm-to-table movement in the Finger Lakes, which began her career in fine dining in 1999. That forward thinking environment allowed her creativity to flourish, using the herb and vegetable gardens on the premises and from local farmers. Adinah learned the art of making classic French pastries and then expanded her range of skills in the kitchen by working in top notch restaurants on Florida’s Gulf Coast and Flagstaff Arizona. Adinah has worked at locally regarded establishments such as Pascale Wine Bar, Dante Tapas Bar, The Aurora Inn and has spent the last several years as a Pastry Chef at Mirbeau Inn and Spa. 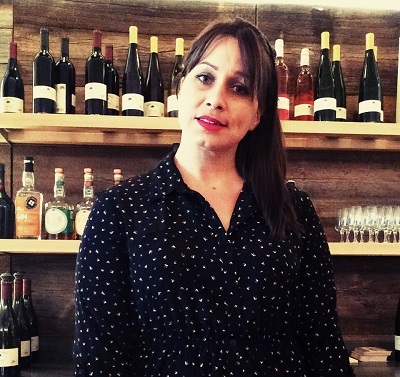 Adinah brings over 17 years of culinary experience and a vast expertise covering everything from garde manger (French for "keeper of the food"), grill, sauté, baking and pastry to White Birch Vineyards. Her focus is on pairing wine and food, she also enjoys teaching cooking classes, and creating specialty items for clients and catered events. Her outside interests are studying herbal medicine, and her artwork is sold in multiple galleries locally. Adinah is putting her many talents to work creating new Tasting Room small plate and dessert offerings, wine pairing dinner menus and catering/amenities menus for our sister properties. White Birch Vineyards is excited to welcome Adinah to our team and look forward to her creativity and culinary skills delighting our customers as much as they delight us. 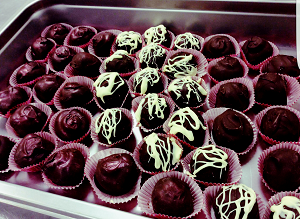 Visit us today to welcome Adinah and to taste one of her delectable truffles, tortes or appetizers. Mid April in the Vineyard! Fortunately, the winter temperatures did not have much effect on our buds this season; resulting in a sigh of relief after three seasons of extensive damage from the cold. The percentage of bud damage we sustained is normal for a seasonable winter. White Birch Vineyard's harvest should be normal this season, provided we do not experience a late frost, hail, or significant rain throughout the season. 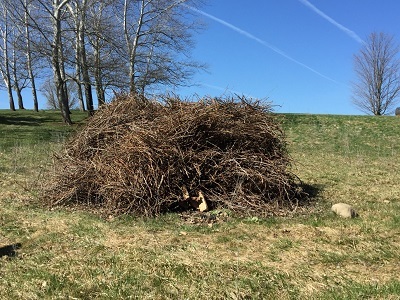 Currently in the vineyard we are pruning out the old wood and putting it in piles to be burned, in order to destroy any overwintering fungus spores. The first picture is about four rows of canes. The second picture was taken about 20 minutes after the first. The canes burn very quickly with massive amount of heat and little smoke once the fire gets going. The next blog entry will be moving dirt away from the vines to give us a level smooth surface to access the vines. With the threat of below-zero temperatures behind us it’s time to gather and check the buds for signs of cold damage. We gather between 100 to 200 buds depending on the size of the block and variety. Pictured to the left are bundles of ten bud sticks ready to be checked. Of the European varieties we grow, Riesling is the most cold hardy and Merlot is the most sensitive. 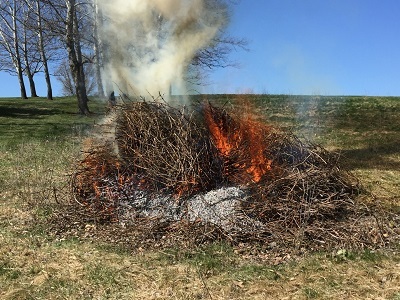 The buds we are currently checking are from canes which were exposed to the air temperatures not buds from the canes which were covered with a protective layer of soil for insulation. 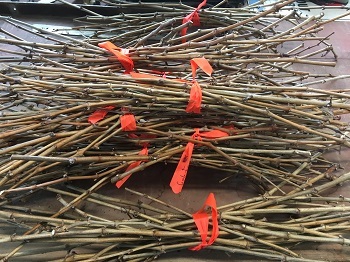 We will check the buds on the buried canes after we have assessed if or how many we may need to use, dependent on the damage to the air-exposed canes. On the vines where we do locate bud damage we will leave more than the usual number of buds on the vine during the pruning process, to hopefully offset the loss. Happy St Patrick's day! Stop by this week and try our own Sparkling Mint Julep! 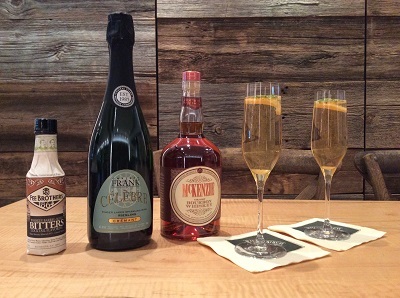 Using all local products: Chateau Frank Sparkling Riesling, McKenzie Bourbon, and a dash of Fee Brothers Bitters. Muddled mint and lemon twist bring this beautiful cocktail together perfectly! St. Valentine's Day at White Birch Vineyards! 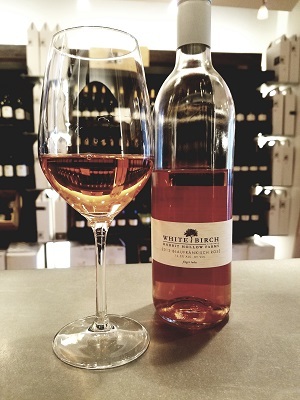 White Birch Vineyard's Rosé will be on a 10% discount for Valentine's weekend only!!! At the Tasting Room we will be serving a Valentine's Day Flight of 3 wines paired with truffles; Raspberry, White Chocolate & Chocolate for $15. Come visit us this Valentine's weekend! Fall Specials Back by Popular Demand! Whats going on in the Tasting Room?